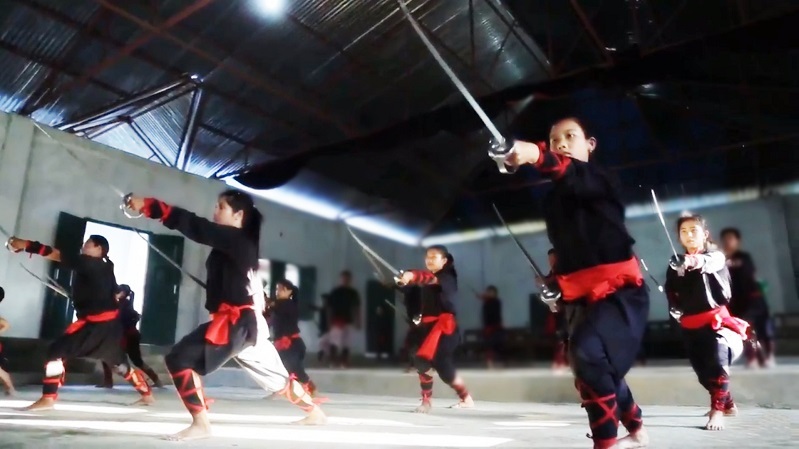 Thang Ta - is an ancient Manipuri Martial Art developed from the war environment of Manipur & created by the Meitei. Thang Ta was also known as Huyen Lallong which means 'The art of sword and the spear'. The art developed from the war environment of Manipur. It played an important role in the geopolitical environment of medieval times in between India and China with many independent states at war with each other. After being prohibited during the period of the colonial raj (1891-1947), Thang Ta became an expressive art form which retained its fighting character at the secret home schools of individual teachers or Gurus. It survived during the period of Manipur’s integration with the Indian Union in 1949, where the art was shown in festivals and performance platforms abroad. Thang emphasizes Phidup (coil), lowering of one’s body near to the ground to enable a spring action for expansion and attack. Ta emphasizes PHANBA, an opening out of the body with two forms, NONGPHAN & LEIPHAL. Thang Ta integrates various external weapons - the sword, spear, dagger, etc. - with the internal practice of physical control through soft movements coordinated with the rhythms of breathing. Thang Ta is practiced in three different ways. The first way is absolutely ritual in nature, related to the 'tantric' practices. The second way consists of a spectacular performance involving sword and spear dances. These dances can be converted into actual fighting practices. The third way is the actual fighting technique.